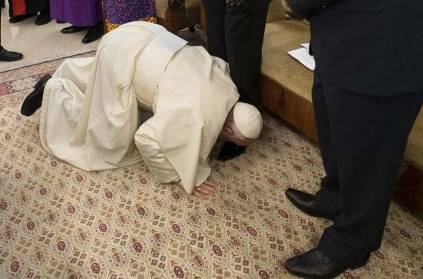 WATCH VIDEO: 82-YEAR-OLD POPE KISSES FEET OF THESE LEADERS, LEAVES EVERYONE SHOCKED! In an act of humbleness, Pope Francis, knelt and kissed the feet of South Sudan's warring leaders and urged them to not return to a civil war. The leaders looked shocked and surprised to see the 82-year-old pope, who suffers from chronic leg pain, kissed the shoes of the two main opposing leaders and several other people in the room. He was helped by aides during this act. According to BBC News, the pope had appealed to President Salva Kiir, his former deputy turned rebel leader Riek Machar, and three other vice presidents to respect each other and commit to forming a unity government next month. He further said "I am asking you as a brother to stay in peace. I am asking you with my heart, let us go forward. There will be many problems but they will not overcome us. Resolve your problems." The media reports further states that the Vatican had brought together South Sudanese leaders inside the pope's residence in an attempt to heal bitter divisions before the country. The country South Sudan gained independence from Sudan in 2011. South Sudan plunged into civil war two years later after Kiir, a Dinka, fired Machar, from the Nuer ethnic group, from the vice presidency. 'கன்னியாஸ்திரிகளுக்கு நடக்கும் வன்கொடுமைகள் உண்மைதான்'.. ஒப்புக்கொண்ட போப்.. பரபரப்பில் மதகுருமார்கள்! This page contains news relating to various facts and events. The views are generally about current affiars and general topics in diversified areas such as political, international, national, and regional issues, sports, health, travel, lifestyle, technology and business. People having similar interets on the above topics will find this page useful. 82-Year-Old Pope Kisses Feet Of Sudan leaders for "Peace", Leaves ever | World News.